Covered at room temperature for up to 2 days. In a large bowl, place the yeast, warm water and one teaspoon of the sugar and stir. Let sit eight minutes, or until thick. Add the remaining sugar, light brown sugar, soymilk, margarine, egg, cinnamon, ginger, vanilla, salt and 2 cups flour and mix either with a wooden spoon or with a dough hook in a stand mixer on low speed. Add ½ cup more flour and mix in. Peel the apples. Grate the larger apple on the large holes of a box grater and add to bowl. Chop the second apple into ¼ inch pieces and add to the bowl. Add ½ cup flour and use either the hook or your hands to knead in the apple pieces. Add ¼ cup flour and mix in. At this point it is easiest to dump the dough on the counter and gently knead the flour into the dough. If it is still very sticky, add another 1 to 2 tablespoons flour and knead in just until the dough comes together and is not sticking to the counter. The dough can be a little sticky in parts. Cover bowl with plastic wrap and let rise at room temperature. Line a cookie sheet with parchment or a Silpat and sprinkle generously with flour. Place another piece of parchment paper on the counter and sprinkle 2 teaspoons flour on top. Scoop up the dough and dump on top. Sprinkle 1 tablespoon flour on top of the dough and then pat down the dough until it is about ½ to 3/4-inch thick; it is easier than using a rolling pin. Use a round 2 1/2-inch cookie cutter to cut out circles, very close to each other in the dough, and place them on the cookie sheet. Re-roll and cut any scraps.Cover the doughnuts with a dishtowel. Let rise 30 minutes. Heat 1½ inches of oil in a medium saucepan and use a candy thermometer to see when the oil stays between 365ºF and 370°F for a few minutes; adjust the flame to keep the oil in that temperature range. Cover a cookie sheet with foil. Place a wire rack on top of the cookie sheet and set near the stovetop. When the oil is ready, add the doughnuts top-side down into the oil and cook for 90 seconds. Drop them one at a time by holding an edge in the oil and then slide it in; if you drop them an inch or higher from the oil, the oil could splatter and burn your fingers. You can cook up to five at a time. 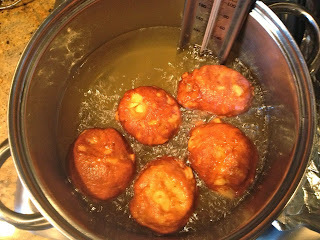 Turn the doughnuts over and cook another 60 to 80 seconds, or until golden. Lift with a slotted spoon and place on the wire rack to cool. Repeat with the remaining doughnuts. 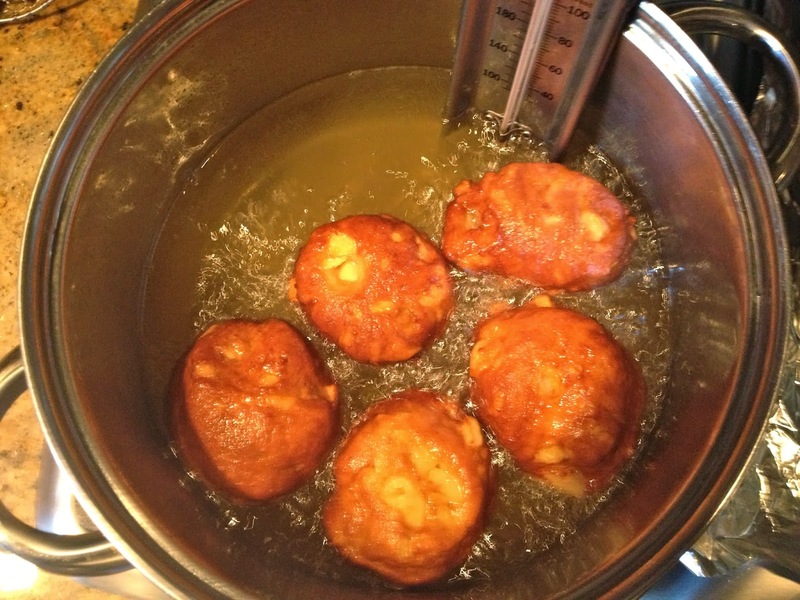 Place the sugar in a shallow bowl and roll the doughnut holes in the sugar to coat. Store covered at room temperature for up to one day and reheat to serve.